The Utah Valley Chamber of Commerce develops its public policy positions through the following established process. The Board of Directors establishes the Chamber’s stance on policy issues. It considers recommendations from advisory bodies such and the Public Policy Committee, the Board of Governors and the Executive Roundtable before taking a stance on critical issues. The Public Policy Committee, consisting of businessmen and women and civic leaders, meets on the first Wednesday of each month to discuss current policy issues. This group serves in an advisory capacity to the Board of Directors and recommends to the Board stances it should take on policy issues. The Public Policy Committee also recommends to the Board of Directors the Chamber’s priorities for each legislative session. The Public Policy Committee meets several times throughout the year with local legislators. They meet in a pre-legislative session to review the Chamber’s legislative priorities. They also meet during the session at Eggs and Issues and at the Capitol during the last four weeks of the legislative session. The Advisory Board of Governors and the Executive Roundtable may be consulted for their opinions regarding political issues and may be recruited to help lobby for or against critical legislation. 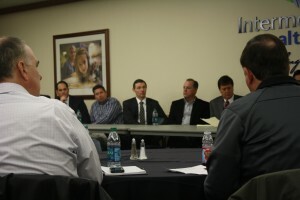 Chamber members are invited to meet with Utah County legislators three times during the session at a Saturday morning breakfast sponsored by Intermountain Healthcare. Legislators speak about happenings in the session and answer questions from the audience.